KIEV, Ukraine -- Representatives of political parties and public organizations have created a movement titled Let's Return Lazarenko's Money to Ukraine. "We are establishing this organization to unite all concerned people, who want, together with us, to achieve one aim – to return money that at present is on the accounts of [former Prime Minister Pavlo] Lazarenko to the Ukrainian public," the former deputy prosecutor general and co-chairman of the public organization "Strength and Honor," Mykola Obykhod, said at a press conference in Interfax-Ukraine on Oct. 8. According to him, the movement will carry out its work "openly and transparently," and it plans to release relevant documents. Explaining the reasons for the creation of such a movement, Obykhod said: "It became clear that Ukraine has dissociated itself from active participation in the U.S. trial [on the case against Lazarenko] where the U.S. raised the issue of confiscating the funds of Pavlo Lazarenko that are in blocked accounts outside Ukraine." MP from the Regions Party Yuriy Boldyrev, in turn, said he sent an inquiry at the end of July of the current year to Chairman of the Supreme Court of Ukraine, Vasyl Onopenko, with a request to confirm whether charges brought by the Prosecutor General’s Office in 2000-2005 against former Premier Yulia Tymoshenko had been dismissed. "The reply by the Supreme Court reads that as I did not specify which personal rights of mine were infringed… it refuses to give such information to me," the MP said. He added that in this case he "could only call on the prosecutor’s office to request the court to give it the information, and then the prosecutor’s office will decide whether to give this information to me." MP from the Communist Party of Ukraine Oleksandr Holub noted that the founders of the movement do not plan to initiate proceedings against Yulia Tymoshenko. "The relevant law enforcement agencies should do this if there are reasons. Our task is to [ensure] that the law receives support at the level of law enforcement agencies and the state. This is our main task," he said. Lazarenko was convicted in the United States of embezzling funds illegally received and transferring them to foreign accounts in 1994-1999. 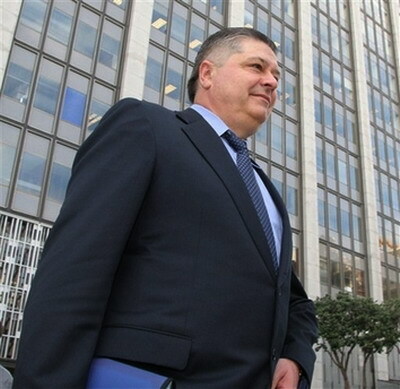 In 2004, a U.S. court dismissed a number of charges against Lazarenko, including all counts related to the corporation Unified Energy System of Ukraine, which was earlier headed by Ukrainian Premier Yulia Tymoshenko, and all charges related to the energy provider Itera. The official indictment retained the fraud charges related to the Naukova agricultural company and the extortion charges related to businessman Petro Kyrychenko's testimony. A Californian court sentenced Lazarenko to nine years in prison in August 2006. He remained in his apartment in San Francisco under house arrest pending the consideration of the appeal against his conviction. On April 10, 2009, a panel of judges of the U.S. 9th Circuit Court of Appeals reconsidered its previous ruling and exonerated Lazarenko from charges of "shifting of stolen funds using computer transfers," said Maryna Dolhopola, who was Lazarenko's attorney at the time.